Oxidative stress is thought to be involved in the mechanism of nerve cell death in Parkinson’s disease (PD). Among several toxic oxidative species, nitric oxide (NO) has been proposed as a key element on the basis of the increased density of glial cells expressing inducible nitric oxide synthase (iNOS) in the substantia nigra (SN) of patients with PD. However, the mechanism of iNOS induction in the CNS is poorly understood, especially under pathological conditions. Because cytokines and FcεRII/CD23 antigen have been implicated in the induction of iNOS in the immune system, we investigated their role in glial cells in vitro and in the SN of patients with PD and matched control subjects. We show that, in vitro, interferon-γ (IFN-γ) together with interleukin-1β (Il-1β) and tumor necrosis factor-α (TNF-α) can induce the expression of CD23 in glial cells. Ligation of CD23 with specific antibodies resulted in the induction of iNOS and the subsequent release of NO. The activation of CD23 also led to an upregulation of TNF-α production, which was dependent on NO release. In the SN of PD patients, a significant increase in the density of glial cells expressing TNF-α, Il-1β, and IFN-γ was observed. Furthermore, although CD23 was not detectable in the SN of control subjects, it was found in both astroglial and microglial cells in parkinsonian patients. Altogether, these data demonstrate the existence of a cytokine/CD23-dependent activation pathway of iNOS and of proinflammatory mediators in glial cells and their involvement in the pathophysiology of PD. The cardinal neuropathological characteristic of Parkinson’s disease (PD) is a massive loss of dopaminergic neurons in the substantia nigra (SN). Although the mechanism by which these neurons degenerate is still unknown, extensive postmortem studies have provided evidence to suggest that oxidative stress is a key component of the pathogenesis of PD (Hirsch, 1993;Jenner, 1998). However, the nature and origin of the free radicals involved in this oxidative stress are not fully known. In line with this, several reports have suggested a deleterious role of the nitric oxide (NO) radical in animal models of the disease in which degeneration of nigral dopaminergic neurons was induced by 1-methyl-4-phenyl-1,2,3,6-tetrahydropyridine (Hantraye et al., 1996;Przedborski et al., 1996; Matthews et al., 1997). Whether NO may also participate in oxidative stress and nerve cell death in PD remains to be determined. Experimental evidence suggests that this may indeed be the case: (1) the concentration of nitrites is increased in the cerebrospinal fluid of patients with PD (Qureshi et al., 1995); (2) the density of glial cells expressing inducible NO-synthase (iNOS/NOS-II) is greatly increased in the SN of parkinsonian patients (Hunot et al., 1996); and (3) 3-nitrotyrosine, an index of protein nitrosation induced by the NO-derived oxidizing molecule peroxynitrite, has been detected in nigral dopaminergic neurons from parkinsonian patients (Good et al., 1998). Taken together, these data support the possibility that increased levels of NO, having reached a toxic threshold, may participate in nerve cell death in PD. Nevertheless, the mechanism of iNOS induction in PD remains to be elucidated. Recent data indicate that functional iNOS expression can be obtained in human macrophages after ligation of the cell surface antigen FcεRII/CD23 (Vouldoukis et al., 1995; Dugas et al., 1998). CD23 is a low-affinity IgE receptor consisting of a 45 kDa transmembrane type-II glycoprotein and is a member of the C-type lectine family (Delespesse et al., 1991). It is expressed at the cell surface of various cell types after stimulation by different cytokines (Dugas et al., 1995). Conversely, it has been shown that the engagement of the CD23 molecule also regulates the production of proinflammatory cytokines such as tumor necrosis factor (TNF)-α and interleukin-6 (Il-6) (Arock et al., 1994; Mossalayi et al., 1994). Although activation of the NO pathway through ligation of CD23 has now been described in human monocytes (Mossalayi et al., 1994), keratinocytes (Bécherel et al., 1996), and eosinophils (Arock et al., 1994), its role in the CNS has yet to be analyzed. To determine whether such a mechanism could also be involved in iNOS activation in the CNS, we first analyzed the implication of various cytokines on CD23 expression and the subsequent induction of iNOS in the 1321N1 astrocytoma cell line in vitro. Second, because the density of both iNOS- and TNF-α-expressing cells has been shown to be increased in the SN of parkinsonian patients (Boka et al., 1994; Hunot et al., 1996), we also examined CD23 and cytokine-producing cells in postmortem samples of patients with PD and matched control subjects. In vitro experiments. 1321N1 astrocytoma cell line was cultured at 2 × 106 cells/ml in Iscove’s modified Dulbecco’s complete medium (Bioproduct, Gagny, France) supplemented with 5% decomplemented fetal calf serum and incubated at 37°C in an atmosphere of 5% CO2. The culture medium was shown to be free of endotoxin, as assessed by the limulus amoebocyte lysate assay (E-toxate, Sigma, St Louis, MO). The cells were cultured for 48 hr in the presence or absence of various doses of recombinant human IFN-γ (Roussel Uclaf, Romainville, France) from 1 to 1000 U/ml to induce the CD23 antigen, in the presence or absence of 10 ng/ml of recombinant human TNF-α (Immunogenex, Los Angeles, CA) and/or 1 ng/ml of recombinant human IL-1β (Immunogenex). After this incubation period, the cells were analyzed by immunochemical staining for CD23 expression using a previously characterized (Rector et al., 1985) monoclonal antibody (mAb) directed against the human CD23 antigen (135 mAb, IgG1 isotype; kindly provided by Dr. E. Kilchherr, Novartis, Basel, Switzerland). The percentage of CD23-positive cells was evaluated on randomly distributed fields view. This percentage was estimated by counting a total number of 200 cells per slide. Nonspecific staining was determined using an isotype-matched (IgG1) anti-CD19 mAb (Immunotech, Marseille, France) as negative control. In our experimental conditions, the CD19 staining never exceeded 2% of the cells. To investigate the consequences of CD23 activation on TNF-α and NO production, cells were preincubated for 48 hr with IFN-γ (1000 U/ml) to induce CD23 expression. They were then harvested from the culture flasks by gentle scraping, resuspended at 2 × 106 cells/ml in fresh Iscove’s modified Dulbecco’s medium supplemented with antibiotics and 5% decomplemented fetal calf serum, and seeded in 6- or 12-well plastic culture plates. To trigger CD23, the cells were then stimulated for 48 hr by a previously defined optimal concentration of the anti-CD23 135 mAb (20 μg/ml) (Paul-Eugène et al., 1995), or by anti-CD19 mAb or MOPC-21 mAb as isotype-matched (IgG1) negative controls. Some cultures were treated with the NOS inhibitor l-NAME (1 mm, Sigma) during anti-CD23 treatment. Cell-free supernatants were then collected to determine TNF-α and nitrite contents. TNF-α concentrations were measured using a specific commercial ELISA kit (Medgenix, France). Nitrites (NO2−), the stable end-products of NO degradation, were determined using the Griess reaction, as described previously (Kolb et al., 1994). Briefly, 100 μl of the supernatant were dispensed in 96-well microplates followed by the addition of 100 μl of a reactive solution composed of 1% sulfanilamide in 30% acetic acid and 0.1% N-(1-naphtyl)ethylenediamine dihydrochloride in 60% acetic acid (1:1 v/v). A standard calibration curve was generated with sodium nitrite (Sigma) diluted in complete Iscove’s medium. Optical density was measured at 540 and 622 nm using an autoreader (Dynatech Laboratories, Alexandria, VA). Analysis of iNOS mRNA was performed on 1321N1 astrocytoma cells by RT-PCR. Forty cycles of amplification were performed, using the following specific primers: iNOS mRNA sense (5′-ATGCCAGATGGCAGCATCAGA-3′, exon 8) and iNOS mRNA antisense (5′-ACTTCCTCCAGGATGTTGTA-3′, exon 11). Hypoxanthine phosphoribosyltransferase (HPRT) mRNA sense (5′-TATGGACAGGACTGAACGTCTTGC-3′) and HPRT mRNA antisense (5′-GACACAAACATGATTCAAATCCCTGA-3′) primers were used as controls. As a positive control, additional RT-PCRs were performed on cDNA from 1321N1 astrocytoma cells treated by LPS and IFN-γ. The PRC product was then sequenced, and a 99% homology was found with the known sequence of the human iNOS. 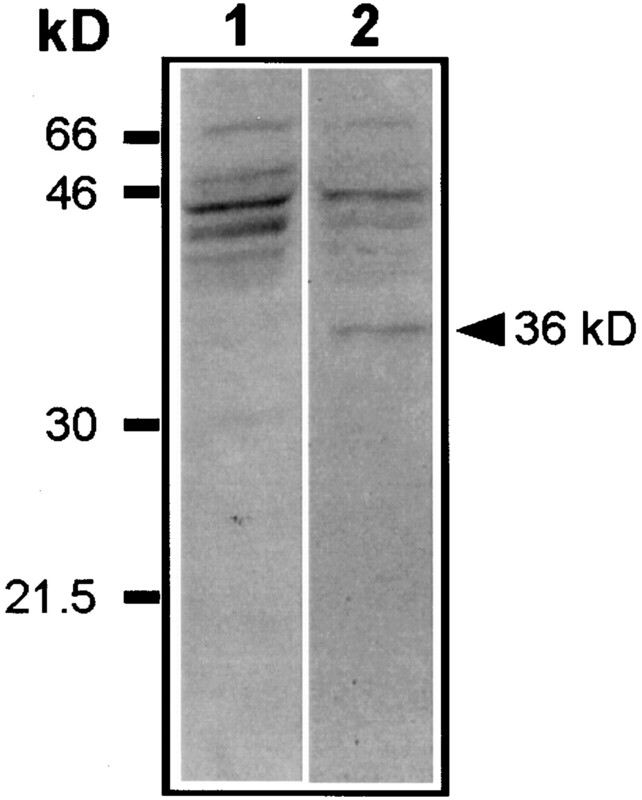 iNOS protein analysis was performed by Western blot. Briefly, cell lysates prepared from culture cells were loaded on an 8% SDS-PAGE gel under reducing conditions. Proteins were then electroblotted onto a nitrocellulose membrane (Hybond ECL, Amersham, Buckinghamshire, UK) and incubated with monoclonal anti-human iNOS antiserum (kindly provided by Dr. R. K. Webber, R&D, Skokie, IL; 1/1000 dilution) for 48 hr at 4°C. Immunoblots were developed by enhanced chemiluminescence (Super Signal, Pierce, Rockford, IL). As control, 1321N1 cells were stimulated for 48 hr with 10 μg/ml LPS (Escherichia coli serotype 0111:B4, Sigma) in combination with IFN-γ (500U/ml) and IL-1β (5 ng/ml). Human brain tissue. The study was performed on autopsy brainstem tissue from 12 control subjects (seven for the cytokine analysis and five for the CD23 analysis) and 12 parkinsonian patients (five for the cytokine analysis and seven for the CD23 analysis) who were well characterized clinically and neuropathologically. For each experiment, PD patients and control subjects did not differ significantly in terms of their mean age at death and the mean interval from death to freezing of tissue (Table1). 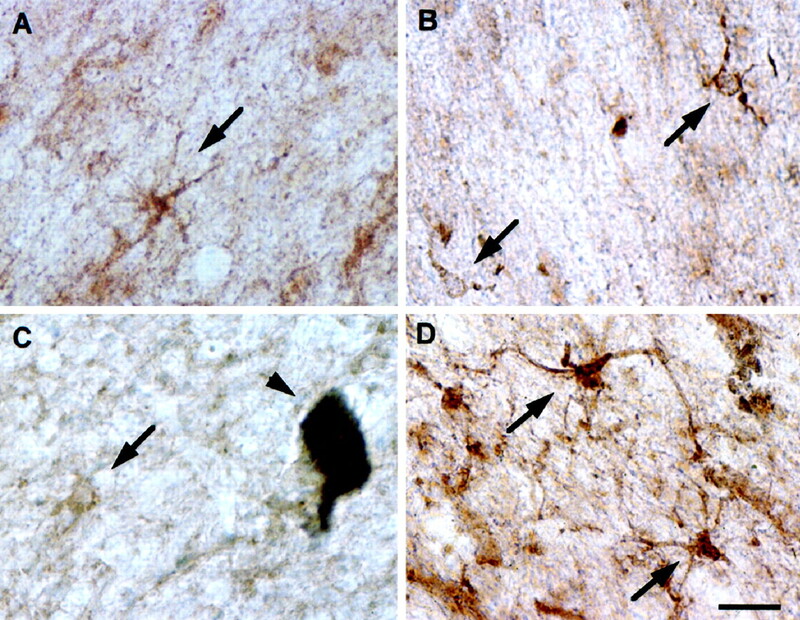 Autopsy striatum tissue from a patient with Huntington’s disease and two control subjects was used as non-PD neurological control for CD23 analysis. Brainstem and striatum tissue were dissected as described previously (Hunot et al., 1996;Gourfinkel-An et al., 1997). Because we found in preliminary experiments that CD23 and cytokine immunodetection were highly sensitive to the fixation procedure, the tissue was fixed in 4% paraformaldehyde and 15% picric acid from a saturated solution for CD23 immunohistochemistry, and in 4% paraformaldehyde and 2.5% glutaraldehyde for cytokine immunohistochemistry, as described previously (Boka et al., 1994; Hunot et al., 1996). Immunohistochemistry. Immunohistochemical labeling was performed on free-floating 40-μm-thick sections of the mesencephalon including the SN pars compacta. Sections were incubated at 4°C for 48–96 hr under gentle agitation in the following primary antisera: anti-TNFα (1:500; Sigma), anti-IFN-γ (1:1000; Genzyme Cambridge, MA), anti-IL-1β (1:250; Genzyme), and anti-CD23 (clone 135, 1–10 μg/ml). The primary antibodies were revealed using the avidin–biotin complex method (Vector Laboratories, Biosys, Compiègne, France) with appropriate secondary antibodies (Hunot et al., 1996) and developed using 0.04% (w/v) diaminobenzidine in 0.25 mTris buffer. To test the specificity of the antisera used for cytokine detection, some sections were incubated with the primary antisera preadsorbed for 6 hr at room temperature with a 2 × 104 excess of the corresponding antigen. Because a sufficient amount of purified CD23 antigen was not available, the specificity of the antibody was analyzed by Western blotting performed on tissue homogenates of human SN, as described by Zhang et al. (1994). To analyze the molecular weight of the peptidic portion of CD23, some homogenates were subjected to enzymatic deglycosylation using a commercial kit (Bio-Rad, Ivry/Seine, France). Briefly, protein extracts (100 μg) from parkinsonian substantia nigra were incubated with NANase II (10 U/ml; 1:8 dilution) and O-glycosidase DS (1 U/ml; 1:8 dilution) for 1 hr at 37°C and then denatured for 5 min at 100°C in denaturating solution (2% SDS and 1 m β-mercaptoethanol; 1:15 dilution). After addition of 6.5% NP-40 (v/v), protein extracts were incubated with PNGase F (2.5 U/ml, 1:20 dilution) for 3 hr at 37°C. Double-staining experiments were performed to determine the type of glial cells expressing CD23, using glial fibrillary acidic protein (GFAP) as a marker of astrocytes and ferritin as a marker of microglial cells (Yoshioka et al., 1992). In brief, free-floating sections of the mesencephalon were mounted on gelatin-double-coated slides and dried for 2 hr at room temperature. After being washed in 0.1 mPBS, tissue sections were successively incubated in 0.2% Triton X-100 for 5 min and 1:30 normal goat serum for 30 min. Sections were then exposed simultaneously to the primary antibodies for 96 hr at 4°C under gentle agitation in the following combinations: mouse anti-CD23 (135 mAb, 25 μg/ml) and rabbit anti-GFAP (1/100, Z0334; Dako, Glostrup, Denmark); mouse anti-CD23 (25 μg/ml) and rabbit anti-ferritin (1/1000; Sigma); mouse anti-GFAP (1/100; M0761, Dako) and rabbit anti-ferritin (1/1000; Sigma). Sections were rinsed three times in 0.1 m PBS containing 0.01% Triton X-100 (PBS-T), incubated in biotinylated sheep anti-mouse IgG (1/50; Amersham) for 1 hr at room temperature, and revealed with fluorescein avidin (1/50; Vector Laboratories) for 30 min at room temperature. Amplification of this staining was obtained by incubating the sections in biotinylated anti-avidin D antibodies (1/50; Vector Laboratories) for 30 min at room temperature and fluorescein avidin DCS for 30 min, successively. After extensive washing in PBS-T, the other primary antiserum was detected by incubating tissue sections in biotinylated goat anti-rabbit IgG (1/50; Vector Laboratories) for 1 hr and revealed with rhodamine 600–avidin D (1/50; Vector Laboratories) for 30 min. Tissues were then washed in PBS-T and mounted with Vectashield medium (Vector Laboratories). Image and data analysis. The density of glial cells expressing cytokines and CD23 in the SN pars compacta was determined on each stained section using a computer-based image analysis system (Biocom, Les Ulis, France). These densities were compared between control subjects and PD patients using a nonparametric statistical test because distributions differed significantly from normality (Mann–Whitney U test; SigmaStat Statistical Software, Jandel, St. Raphael, CA). Treatment of the 1321N1 astrocytoma cell line using IFN-γ provoked a dose-dependent expression of CD23 reaching ∼30% of the cells labeled for the maximal dose of IFN-γ used (1000 U/ml;p < 0.01) (Fig. 1). Co-incubation with IFN-γ and TNF-α or Il-1β increased the proportion of CD23-positive cells compared with cultures treated with IFN-γ alone (Fig. 1). The extent of this additive effect of TNF-α and Il-1β on IFN-γ-induced CD23 expression was comparable for both cytokines. Furthermore, co-incubation with the three cytokines provoked a further increase in the proportion of cells expressing CD23 (p < 0.05) (Fig. 1). By contrast, incubation with Il-1β or TNF-α alone was unable to induce CD23 expression (data not shown). Induction of CD23 expression in 1321N1 astrocytoma cells by various cytokines. Cells were treated for 48 hr with various doses of interferon-γ (IFN-γ) (1–1000 U/ml) alone or in combination with interleukin-1β (Il-1β) (1 ng/ml), and/or tumor necrosis factor α (TNF-α) (10 ng/ml). CD23-positive cells were detected by immunocytochemical methods. Results are expressed as the mean percentage of CD23-positive cells ± SEM in three independent experiments. *Significantly different from cells with culture medium alone (p < 0.01); **significantly different from cells treated with IFN-γ alone (p < 0.05); two-tailed t test. Stimulation of CD23 using the anti-CD23 135 mAb in cells pretreated with IFN-γ provoked a 7.7- and 53-fold increase in nitrites (Fig. 2A) and TNF-α (Fig. 2B) levels in the culture medium, respectively (p < 0.01). No significant increase in nitrites and TNF-α production was observed when the cells were treated with isotype-matched (IgG1) negative controls (anti-CD19 and anti-MOPC-21). However, a moderate level of nitrites was detectable in the unstimulated and isotype-matched negative control (IgG1)-stimulated cultures as a result of the treatment with IFN-γ that was necessary to induce the expression of CD23. Furthermore, the addition of a specific NOS inhibitor (l-NAME) to the culture medium blocked the production of both nitrites (p < 0.05) and TNF-α (p < 0.01) because of the ligation of CD23 (Fig. 2C). Finally, ligation of CD23-positive 1321N1 cells obtained after IFN-γ treatment resulted in iNOS mRNA transcription (Fig. 2D) and iNOS protein expression (Fig.2E). iNOS mRNA transcription was not observed using isotype-matched (IgG1) negative controls. Ligation of CD23 induces production of nitrites and TNF-α in 1321N1 astrocytoma cells. After CD23 induction by IFN-γ (1000 U/ml for 48 hr), cells were incubated for 48 hr with 10–20 μg/ml of anti-CD23 135 mAb to trigger the CD23 antigen, or with an isotype-matched negative control IgG1. Nitrite (A) and TNF-α (B) levels were determined in the supernatant 48 hr after the beginning of the treatment. Some of the experiments were performed in the presence of 1 mml-NAME (C). Results are expressed as the mean ± SEM in three independent experiments. *Significantly different compared with untreated cells (p < 0.01, two-tailed ttest). Significantly different from cultures treated with anti-CD23 mAb alone: †p < 0.05; ††p < 0.01, two-tailed t test. ND, Nondetectable. D, After CD23 ligation in IFN-γ-treated 1321N1 glial cells, total mRNA was extracted and assayed for iNOS mRNA expression by RT-PCR. HPRT amplification was used as a control. As a positive control some cells were treated with IFN-γ and LPS to induce iNOS. E, Western blot analysis of treated cells using mouse anti-human iNOS antiserum. In D andE, Control indicates untreated cells,IFN-γ indicates cells stimulated by IFN-γ, andIFN-γ+anti-CD23mAb indicates cells stimulated by IFN-γ and subsequently treated by a monoclonal antibody raised against CD23 or an isotype-matched immunoglobulin (IgG1) as a negative control. On tissue sections, staining intensity decreased with lower antibody concentrations, and no staining was observed when the primary antisera were omitted and when preadsorption tests were performed with a large excess of the homologous antigen for the antibodies directed against the cytokines (data not shown). As a further test of the specificity of the anti-CD23 antiserum, Western immunoblotting of proteins extracted from the SN of parkinsonian patients showed several bands with molecular weights ranging from 41 to 67 kDa with two major bands at 45 and 43 kDa (Fig. 3), as expected from previous studies (Nakajima and Delespesse, 1986; Bonnefoy et al., 1987; Yukawa et al., 1987). After enzymatic deglycosylation, the intensity of most of these bands was decreased, and a 36 kDa band appeared, corresponding to the molecular weight deduced from the peptidic sequence (Ludin et al., 1987) (Fig. 3). Western blot of CD23 from SN of a patient with PD after SDS-PAGE, blotting on nitrocellulose membranes, and immunodetection with 135 mAb against CD23. After revelation by enhanced chemiluminescence, two major bands at 45 and 43 kDa were observed together with minor bands ranging from 41 to 67 kDa (lane 1). Treatment of tissue homogenate by enzymatic deglycosylation revealed a new band at 36 kDa, corresponding to the molecular weight deduced from the peptidic sequence of CD23 (lane 2). Cytokines were observed exclusively in glial cells in the human SN (Fig.4A–C). For the three cytokines analyzed, the labeled perikarya were round, with a diameter ranging between 8 and 10 μm. They displayed numerous thin immunostained processes, except for IFN-γ-stained sections, in which the processes were hardly visible. These cells were located throughout the parenchyma of the SN and often in the vicinity of blood vessels. 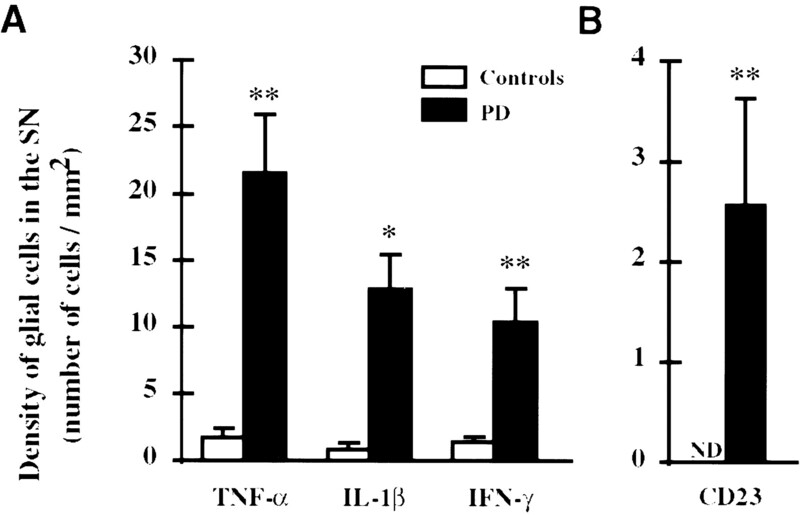 Their density was very low in the SN of control subjects and significantly higher in the SN of patients with PD (IFN-γ,p < 0.01; Il-1β, p < 0.05; TNF-α,p < 0.01) (Fig.5A). Immunohistochemical detection of pro-inflammatory mediators in sections of the parkinsonian SN. Sections were immunostained to reveal TNF-α (A), IL-1β (B), IFN-γ (C), and CD23 (D). Arrows, Immunostained glial cells; arrowhead, melanized dopaminergic neuron. Scale bar, 20 μm. Density of glial cells expressing TNF-α, Il-1β, and IFN-γ (A) and CD23 (B) in the SN of patients with PD and matched control subjects. Each value represents the mean density of immunostained cells ±SEM. Significant differences between parkinsonian patients and control subjects according to Mann–WhitneyU test: *p < 0.05; **p < 0.01. ND, Nondetectable. CD23 immunoreactivity was observed in glial cells with variable size (diameter ranging between 8 and 15 μm) in the SN of patients with PD (Fig. 4D). Their distribution was extremely variable within the SN and, in some patients, mostly concentrated in the vicinity of blood vessels. Some of these cells displayed numerous long immunostained processes reminiscent of astrocytes. Double-staining experiments confirmed the heterogeneous populations of the CD23-labeled cells (Fig. 6). Indeed, although colocalization of GFAP and ferritin was never observed (Fig.6A,B), confirming the specificity of the markers used, colocalization of CD23 with both GFAP and ferritin was observed (Fig. 6C–F). Yet, at simple visual inspection, the proportion of astrocytes (GFAP-positive cells) expressing CD23 was higher than that of microglial cells (ferritin-positive cells). The quantitative analysis of CD23-positive cells confirmed their absence in the SN of control subjects and their presence in that of patients with PD (p = 0.001) (Fig. 5B). Finally, numerous glial cells were found to weakly express CD23 in the striatum (putamen and caudate nucleus) of a patient with Huntington’s disease but not of control subjects. Double-immunofluorescence staining of CD23 and glial markers in the SN of patients with PD. GFAP and ferritin were used as markers of astrocytes and microglial cells, respectively. 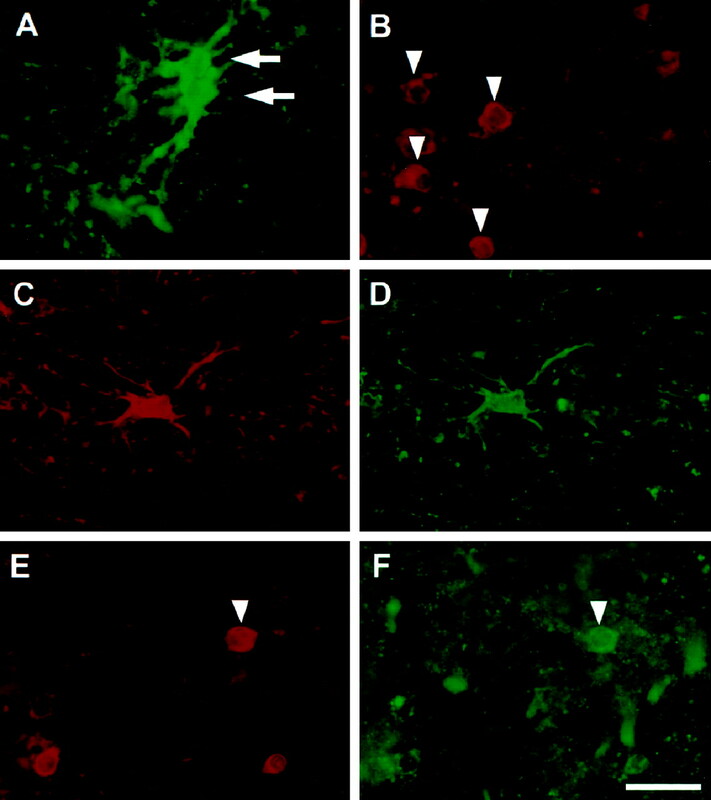 Positive astrocytes are indicated by arrows inA, and microglial cells are indicated byarrowheads in B. On sections stained simultaneously for GFAP (A) and ferritin (B), no cells were stained for both markers. On double-stained sections, CD23 (D,F) was detected in astrocytes (C) and some microglial cells (E). Microglial cells expressing CD23 are indicated by an arrowhead in E andF. Scale bar, 20 μm. The major finding of our study is the implication of a cytokine/CD23-dependent activation pathway of iNOS and of pro-inflammatory mediators in human glial cells and their possible role in the pathophysiology of PD. This pathway has already been described for cells of the immune system (Arock et al., 1994; Mossalayi et al., 1994; Vouldoukis et al., 1995) and keratinocytes (Bécherel et al., 1996) in human and rat macrophages (Alonso et al., 1995). Human CD23 is expressed as two isoforms, a and b, that differ in their cytoplasmic N-terminal tail (Delespesse et al., 1991). The a isoform is expressed constitutively in normal B lymphocytes, whereas the b isoform is expressed after appropriate activation in several other cell types (Dugas et al., 1995). Our results show that the CD23b isoform can also be expressed by glial cells of the CNS. Similar to human monocytes/macrophages, the expression of CD23b in glial cells requires the activation of these cells by various cytokines. In our cell line, IFN-γ was shown to be sufficient to induce CD23 expression. 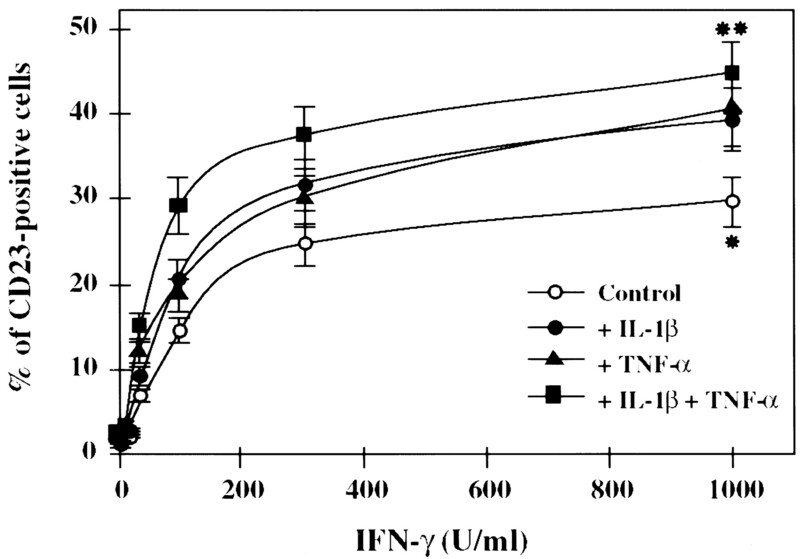 However, an additive effect was obtained by the addition of other cytokines, as already shown for other cell types (Bieber et al., 1989), indicating a potentiation effect of both TNF-α and Il-1β on IFN-γ-mediated CD23 expression. However, neither TNF-α nor Il-1β, used alone, had an effect, suggesting that they represent activators of the IFN-γ-mediated expression of CD23 rather than direct inducers of CD23 expression. Nevertheless, the precise mechanism by which IFN-γ induces CD23 expression remains to be identified. CD23 appears to mediate various biological activities, including cell–cell adhesion, B-cell survival in germinal centers, histamine release from basophils, and regulation of IgE synthesis (Bonnefoy et al., 1993). Our in vitro experiments suggest that it can induce NO production in the CNS. Indeed, ligation of CD23 antigen in our astrocytic cell line induces the release of nitrites in the culture supernatant (Fig. 2A). This production of nitrites is abolished by addition in the culture medium of l-NAME, an inhibitor of NOS, suggesting that the engagement of CD23 at the surface of astrocytes leads to the induction of iNOS, as shown by RT-PCR mRNA and protein immunoblot analysis. These data are compatible with a previous demonstration of iNOS induction after activation of CD23 in human macrophages (Vouldoukis et al., 1995). Furthermore, in the later system, NO production has been shown to be particularly high and thus capable of inducing the death of the parasite Leischmania major (Vouldoukis et al., 1995). If these data could be extrapolated to our system, they would suggest that CD23-induced NO production by astrocytes in the CNS could play a deleterious role for surrounding cells, especially nigral dopaminergic neurons, the relevant cells in PD. Another issue raised by our in vitro data is that the engagement of CD23 is capable not only of inducing iNOS expression but also of stimulating the production of pro-inflammatory cytokines such as TNF-α (Fig. 2B). A CD23-induced production of TNF-α has already been reported in human eosinophils (Arock et al., 1994) and purified monocytes, in which a concomitant production of Il-6 has also been shown (Mossalayi et al., 1994). In addition, NO release seems to play a major role in CD23-induced TNF-α production, because it is inhibited by the NOS inhibitor l-NAME (Fig.2C). Because TNF-α has also been shown to induce iNOS in glial cells and to stimulate the expression of CD23 by IFN-γ, our results suggest a mutual potentiation of the pro-inflammatory reaction in glial cells by these molecules. Taken as a whole, our data indicate that CD23 may represent a possible regulator of the inflammation mediated by glial cells in the CNS, as proposed for immune cells (Fig.7). Schematic representation of CD23-mediated iNOS induction and TNF-α production pathway in glial cells. Pro-inflammatory cytokines, such as IFN-γ, induce the expression of CD23 in glial cells. This effect is potentiated by TNF-α and IL-1β. 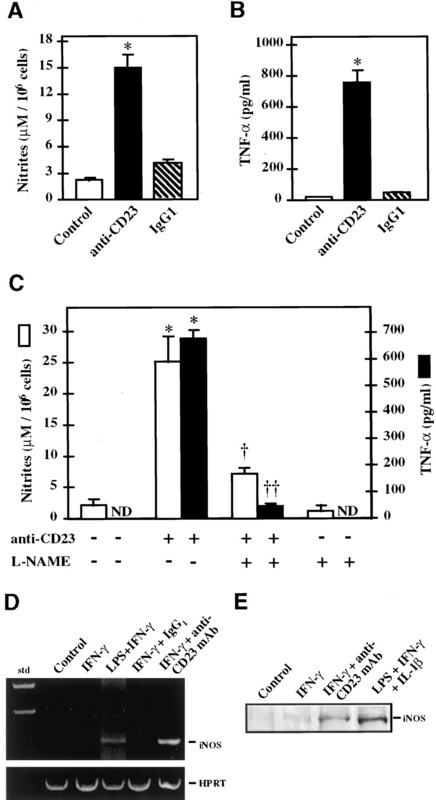 Triggering of CD23 antigen by an appropriate ligand results in iNOS induction and the subsequent release of NO, which in turn upregulates the production of TNF-α. The NOS inhibitor l-NAME completely inhibits the production of both NO and TNF-α in vitro. This pathways results in an auto-amplification of NO production, which could reach a toxic threshold. NO toxicity would in part involve the formation of peroxynitrite, which has been shown to initiate lipid peroxidation and protein oxidation and inactivation. All of these events could contribute to the death of dopaminergic neurons in PD. Given that the density of iNOS- and TNF-α-containing glial cells is increased in the SN of patients with PD, one may speculate that such a pro-inflammatory pathway is also activated in this disease. This hypothesis cannot be tested directly on the basis of experiments performed on postmortem human brain. However, interestingly, glial cells expressing CD23 were detected in the SN of patients with PD but not of control subjects, suggesting that CD23 may also play a role in the pathophysiology of this disorder. Double-staining experiments with specific markers indicated that CD23 is expressed by both astrocytes and microglial cells, suggesting that both cell types may participate in the inflammatory process during the progression of PD. The expression of CD23 by microglial cells is in agreement with in vitro studies using human embryonic microglial cells, in which Il-4 stimulation has been shown to induce CD23 (N. Dugas, unpublished results). The mechanism of CD23 induction in PD is not known. Nevertheless, the in vitro experiments suggest that the pro-inflammatory cytokines may represent potential candidates. This concept is supported by the huge increase in the density of IFN-γ-, Il-1β-, and TNF-α-expressing glial cells in the SN of patients with PD (Fig. 5A). From a more general point of view, these data suggest a role for glial cells in the pathophysiology of PD. In line with this, McGeer et al. (1988) reported an increased expression of HLA–DR-positive glial cells in the SN of parkinsonian patients, which may be related to the fact that HLA–DR and CD23 antigens have been shown to be spatially associated on B lymphocyte cell membrane and to be regulated in a coordinated manner. (Bonnefoy et al., 1988; Rousset et al., 1988; Flores-Romo et al., 1990). The increased density of cytokine-producing glial cells in the SN of patients with PD may have several implications for the pathophysiology of the disease. Although the possibility that these cytokines have a neuroprotective effect cannot be excluded (Maeda et al., 1994; Barger et al., 1995), it seems very likely that, when chronically produced in high amounts, they play a deleterious role (for review, see Campbell, 1998). This concept is supported by the fact that anti-inflammatory agents have been shown to protect dopaminergic neurons against degeneration in animal models of the disease (Matsuura et al., 1996;Boireau et al., 1997). Such a deleterious effect may be mediated either by a direct action involving receptors for the cytokines or by more indirect mechanisms. Indeed, TNF-α through interaction with its receptor can activate a ceramide-dependent pro-apoptotic pathway; evidence for such an activation has been reported in nigral dopaminergic neurons from patients with PD (Hunot et al., 1997). The cytokines may also play an indirectly deleterious role by inducing the expression of iNOS in astrocytes and microglial cells, as shown previously (Chao et al., 1996; Ding et al., 1997). Our results suggest that CD23 participates in this induction and could positively regulate this activation, thus further increasing the production of NO, which could then reach a toxic threshold for the surrounding neurons (Fig.7). NO is thought to exert its toxic effect mainly by an interaction with superoxide radicals, leading to the formation of peroxynitrite, a highly oxidizing molecule (Beckman et al., 1990; Dawson and Snyder, 1994). The presence of nitrotyrosine in the SN of patients with PD, and especially in Lewy bodies, supports this hypothesis (Good et al., 1998). NO could also induce deleterious effects by releasing iron from ferritin and by its action on iron metabolism through its interaction with iron regulatory proteins (Reif and Simmons, 1990; Pantopoulos and Hentze, 1995). This may explain in part some alterations in iron metabolism observed in PD (Hirsch and Faucheux, 1998) and the subsequent oxidative stress. It seems highly likely that the increased production of inflammatory mediators, and in particular of CD23, in PD is not specific to the disease, because it has also been observed in Huntington’s disease and also in patients with Alzheimer’s disease, multiple sclerosis, and HIV encephalitis (N. Dugas and A. Calenda, unpublished results). However, it probably represents a major step in the pathophysiology of PD that could potentially perpetuate the pathological process. In this context, interrupting the inflammatory reaction in this disease may represent a therapeutic intervention that could reduce the progression of the pathological process. This study was supported by the Fondation pour la Recherche Médicale (S.H. ), Institut National de la Santé et de la Recherche Médicale, the Association Claude Bernard pour le Développement des Recherches Biologiques et Médicales dans les Hôpitaux de l’Assistance Publique à Paris (B.A.F. ), and the National Parkinson Foundation (Miami, FL) (Y.A.). We thank Drs. H. Beck, J. Y. Beinis, A. M. Bonnet, J. P. Bouchon, C. Duyckaerts, J. J. Hauw, M. Laurent, R. Moulias, F. Piette, A. Sachet, O. Saint Jean, and M. Verny for their clinical investigations and cooperation in providing the brain specimens, and C. Betard for his technical assistance. Correspondence should be addressed to Dr. Etienne C. Hirsch, Institut National de la Santé et de la Recherche Médicale U289, Hôpital de la Salpêtrière, 47 Boulevard de l’Hôpital, F-75013 Paris, France. (1995) Nitric oxide synthesis in rat peritoneal macrophages is induced by IgE/DNP complexes and cyclic AMP analogues. Evidence in favor of a common signaling mechanism. J Immunol 154:6475–6483. (1994) Involvement of FcεRII/CD23 and L-arginine dependent pathway in IgE-mediated activation of human eosinophils. Biochem Biophys Res Commun 203:265–271. (1995) Tumor necrosis factors α and β protect neurons against amyloid β-peptide toxicity: evidence for involvement of a κB-binding factor and attenuation of peroxide and Ca2+ accumulation. Proc Natl Acad Sci USA 92:9328–9332. (1996) CD23-mediated nitric oxide synthase pathway induction in human keratinocytes is inhibited by retinoic acid derivatives. J Invest Dermatol 106:1182–1186. (1990) Apparent hydroxyl radical production by peroxynitrite: implications for endothelial injury from nitric oxide and superoxide. Proc Natl Acad Sci USA 87:1620–1624. (1989) Induction of FcεRII/CD23 on human epidermal Langerhans cells by human recombinant interleukin 4 and gamma interferon. J Exp Med 170:309–314. (1997) Thalidomide reduces MPTP-induced decrease in striatal dopamine levels in mice. Neurosci Lett 234:123–126. (1994) Immunocytochemical analysis of tumor necrosis factor and its receptors in Parkinson’s disease. Neurosci Lett 172:151–154. (1987) Production and characterization of a monoclonal antibody specific for the human lymphocyte low affinity receptor for IgE: CD23 is a low affinity receptor for IgE. J Immunol 138:2970–2978. (1988) The low-affinity receptor for IgE (CD23) on B lymphocytes is spatially associated with HLA-DR antigens. J Exp Med 167:57–72. (1993) Receptors for IgE. Curr Opin Immunol 5:944–949. (1998) Structural and functional impact of the transgenic expression of cytokines in the CNS. Ann NY Acad Sci 840:83–96. (1996) Cytokine-stimulated astrocytes damage human neurons via a nitric oxide mechanism. Glia 16:276–284. (1994) Gases as biological messengers: nitric oxide and carbon monoxide in the brain. J Neurosci 14:5147–5159. (1991) Expression, structure, and function of the CD23 antigen. Adv Immunol 49:149–191. (1997) Inducible nitric-oxide synthase and nitric oxide production in human fetal astrocytes and microglia. A kinetic analysis. J Biol Chem 272:11327–11335. (1995) Nitric oxide production by human monocytes: evidence for a role of CD23. Immunol Today 16:574–580. (1998) Regulation by endogenous interleukin-10 of the expression of nitric oxide synthase induced after ligation of CD23 in human macrophages. Cytokine 10:680–689. (1990) Functional implication for the topographical relationship between MHC class II and low-affinity IgE receptor: occupancy of CD23 prevents B lymphocytes from stimulating allogeneic mixed lymphocyte responses. Eur J Immunol 20:2465–2469. (1998) Protein nitration in Parkinson’s disease. J Neuropathol Exp Neurol 57:338–342. (1997) Differential distribution of the normal and mutated forms of Huntingtin in the human brain. Ann Neurol 42:712–719. (1996) Inhibition of neuronal nitric oxide synthase prevents MPTP-induced parkinsonism in baboons. Nat Med 2:1017–1021. (1993) Does oxidative stress participate in nerve cell death in Parkinson’s disease. Eur Neurol 33[Suppl 1]:52–59. (1998) Iron metabolism and Parkinson’s disease. Mov Dis 13[Suppl 1]:39–45. (1996) Nitric oxide synthase and neuronal vulnerability in Parkinson’s disease. Neuroscience 72:355–363. (1997) Nuclear translocation of NF-κB is increased in dopaminergic neurons of patients with Parkinson’s disease. Proc Natl Acad Sci USA 94:7531–7536. (1998) Oxidative mechanisms in nigral cell death in Parkinson’s disease. Mov Disord 13[Suppl 1]:24–34. (1994) Interleukine-4 stimulates cGMP production by IFN-γ-activated human monocytes. Involvement of the nitric oxide synthase pathway. J Biol Chem 269:9811–9816. (1987) Cloning and expression of the cDNA coding for a human lymphocyte IgE receptor. EMBO J 6:109–114. (1994) Hypoxia/reoxygenation-mediated induction of astrocyte interleukin 6: a paracrine mechanism potentially enhancing neuron survival. J Exp Med 180:2297–2308. (1996) Cyclosporin A attenuates degeneration of dopaminergic neurons induced by 6-hydroxydopamine in the mouse brain. Brain Res 733:101–104. (1997) MPP+ induced substantia nigra degeneration is attenuated in nNOS knockout mice. Neurobiol Dis 4:114–121. (1988) Reactive microglia are positive for HLA-DR in the substantia nigra of Parkinson’s and Alzheimer’s disease brains. Neurology 38:1285–1291. (1994) Involvement of FcεRII/CD23 and L-arginine-dependent pathway in IgE-mediated stimulation of human monocyte functions. Int Immunol 6:931–934. (1986) IgE receptors on human lymphocytes. I. Identification of the molecules binding to monoclonal anti-Fc epsilon receptor antibodies. Eur J Immunol 16:809–814. (1995) Nitric oxide signaling to iron-regulatory protein: direct control of ferritin mRNA translation and transferrin receptor mRNA stability in transfected fibroblasts. Proc Natl Acad Sci USA 92:1267–1271. (1995) Ligation of CD23 activates soluble guanylate cyclase in human monocytes via an L-arginine-dependent mechanism. J Leukoc Biol 57:160–167. (1996) Role of neuronal nitric oxide in 1-methyl-4-phenyl-1,2,3,6-tetrahydropyridine (MPTP)-induced dopaminergic neurotoxicity. Proc Natl Acad Sci USA 93:4565–4571. (1995) Increased cerebrospinal fluid concentration of nitrite in Parkinson’s disease. NeuroReport 6:1642–1644. (1985) Detection and characterization of monoclonal antibodies specific to IgE receptors on human lymphocytes by flow cytometry. Immunology 55:481–486. (1990) Nitric oxide mediates iron release from ferritin. Arch Biochem Biophys 283:537–541. (1988) Regulation of Fc receptor for IgE (CD23) and class II MHC antigen expression on Burkitt’s lymphoma cell lines by human IL-4 and IFN-γ. J Immunol 140:2625–2632. (1995) The killing of Leishmania major by human macrophages is mediated by nitric oxide induced after ligation of the FcεRII/CD23 surface antigen. Proc Natl Acad Sci USA 92:7804–7808. (1992) Simultaneous detection of ferritin and HIV-1 in reactive microglia. Acta Neuropathol (Berl) 84:297–306. (1987) A B cell-specific differentiation antigen, CD23, is a receptor for IgE (FcεR) on lymphocytes. J Immunol 138:2576–2580. (1994) Distribution of manganese-dependent superoxide dismutase in the human brain. Neuroscience 61:317–330.